This winter, every day we hear that some people suffer from flu or even die from the flu. This has caused major fear in the public. It is a big thing that we need to address, but how to prevent it is more important. Flu shots only work for some people. Tama-Flu also only works on some people. What we need to do is to learn to prevent getting sick by strengthening our immune system with daily qi practice. "qi" is vital energy in the body; "gong" is practice to gain the skill. Qi practice is also qi gong practice. Our immune system is the defense system that protects our body from sickness. With a strong and balanced immune system, the body can protect itself. Or if we do get cold or flu, the body recovers quicker. How can we achieve that? This article is to teach you how. Stress is one of the major causes of reducing our immune function. Stress creates blockages in the body energy pathways, affects organ function, affects nervous system function and does much more damage to our body. You have a choice to either remove it or manage it. If we think it is stressful and react our body is intense, then you have more stress. If we think it is part of life, then you just need to deal with it, you don't have as much stress, but we do have work to do. How you think is a big part of stress management. By changing the way you think, you can change your life. Maybe an unhealthy diet is from habit? But it can be reversed by learning and mindful practice. Anything can change, so can our diets. 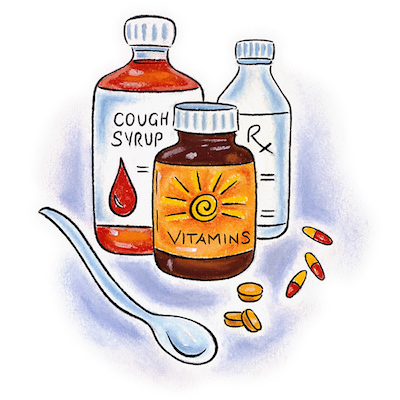 Certain medications can reduce our immune function. However, if you must use medication, perhaps it is better to avoid your exposure to people who possibly have a cold or flu, or avoid places that are not clean. Our body is like a machine that needs to work and rest. If only work and work without rest, sooner or later it will break, we call this "disease." Again, our body is like a machine, needs to work and be maintained. If we only work without maintenance, the body can malfunction from imbalance. Even our computers and cell phones need some periodic maintenance to work. If our mind is over worked, we exhaust our resources and this makes us unable to process efficiently. The mind affects the body, and our body affects our mind. Both need to be nourished and taken care of. If we do have chronic illness, this is an incentive to do qi gong because qi gong is the best exercise for healing. We have discussed that the body affects the mind and the mind affects body. Emotion imbalance can do a lot of harm to our body. Therefore, to keep our emotion balanced is very important. I offer special programs to help with this emotional imbalance. See my web site for listings. You will be amazed how much difference you can make in just one day. This also affects your immune system. Dealing with this either with your doctor or with the holistic way is necessary. Now that you understand these processes, you can learn to have daily practice of qi gong to strengthen our immune system. Daily usage of qi gong will help to defeat the flu. Try these exercises. Raise your arms in the front of the body and above your head as you inhale; separate your arms then move them down along the side of your body as you exhale. Have your eyes follow your left hand as it moves down your left side. Again, raise your arms in the front of the body and above the head as you inhale; move your arms down along the side of your body as you exhale. Have your eyes follow the right hand as it moves down your right side. Do this movement 4 times on each side. Interlock your fingers and raise your arms up above your head as you inhale. Bending forward with your arms still extended, touch floor; relax the upper body and arms while taking three deep breaths. Slowly roll up the body, returning to standing position. Repeat this movement 4 times. Take a deep breath as you move your arms up along the side of your body then above your head and turn your body to the right as you keep your arms extended. As you exhale, turn your body to center and turn your palms down. Inhale as you move your arms up along the side of your body then above your head and turn your body to the left as you keep your arms extended. As you exhale, turn your body to center and turn your palms down. Keeping your palms down, lower your hands in front of your body. Inhale and raise your hands up along your back. When your hands reach chest level, move your arms to front of the body. Exhale and press your hands down all the way until fingers (hands) touch floor. If you cannot reach the floor, put your hands on your ankles or shins. Slowly roll up the body while taking a full breath. The above two movements make one set. Repeat this for total 4 sets. Starting with your hands in front of you, at the level of your lower abdomen, turn your left hand palm up and keep your right hand palm down. Inhale and raise your left hand up as high as you can, at same time push your right hand downward as low as you can; exhale and relax both hands, letting them meet in front of your lower abdomen. Now turn your right palm up and your left palm down. Inhale and raise your right hand up as high as you can, at same time push your left hand downward as low as you can. Exhale and relax both hands letting them meet in front of your lower abdomen. Repeat these movements 8 to 16 times, 4 to 8 times on each side. Ending, start with "Y" pose for three breaths, then gently press down at exhale. To perform the "Y" pose, inhale and raise your arms up and apart to form a "Y,"
Focus your mind to connect energy from heaven to the earth. Receive energy from heaven into your fingertips, through your hands, arms, body, legs, feet, connecting energy to the earth. The above is an article written by Dr. Aihan Kuhn and in her February 2018 Natural Healing Newsletter.